Author’s Note: Out of respect for Grandmaster Zhao Bichen, his great grandson – Master Zhao Ming Wang - the Zhao Family of Beijing, and the ‘Zhao Gate’ (which the Zhao Family maintains, supports and perpetuates), I have translated a short extract from a page of Master Zhao Bichen’s text entitled ‘Essential Nature Secret Law Complete Book’. I acquired this text from a Qianfeng Daoist disciple in Beijing (which I believe was carefully copy-typed by hand from the original book). Where possible, I have checked other available (and related) Chinese language texts to verify and confirm various points of geography, names, processes and conventions. I have treated this work as an act of respectful meditation and taken extra care in the translation work. Master Zhao Bichen is quoting ancient texts (either conveyed to him in verbal or written form from his teachers), and often uses traditional characters and the occasional concept not altogether clear (even if the characters can be ‘read’). Although four men are referred to in this text as ‘Generation Ancestral Masters’, in fact with Master Zhang Jingxu being included, this means that there are ‘five’ Generation Ancestral Masters, with Master Zhang Jingxu being the ‘5th Generation Ancestral Master’ of the Longmen-Wu Liu tradition. There is talk of a ‘way fee’, or ‘Dao fee’ (道费 – Dao Fei) in this text in relation to Masters Zhang Jingxu, Li Xuan and Cai Huanyang – to be paid in 5 or 6 silver taels. This might be a straightforward matter of money for impoverished Daoist ascetics to live on, or it might carry a metaphorical meaning referring to ‘hidden’ processes of advanced nei dan training. It could well be ‘coded’ language referring to both interpretations. One discrepancy in the Chinese language text is that of the name of Old Master Kun Yun (壸云) which is written as ‘壶云’ or ‘Hu Yun’. This might be an alternative spelling (壶Hu for 壸Kun) or it might be a copying error. Whatever the case, I have used the more complete character of ‘壸Kun’ in the translation of the name (which agrees with this name in other texts). Whereas ‘壶Hu’ refers to a ‘vase’ (or ‘pot’). ‘壸Kun’ translates as a ‘corridor in a palace’ – with ‘云Yun’ referring to ‘cloud’ or to ‘speak’, etc. If it is a copying error, it probably occurred with the transmission of the text from the book into digital format. The ‘Dragon Gate’ (Longmen) is a branch of the earlier ‘Complete Reality’ (Quanzhen) School, with the ‘Wu Liu’ School being a distinct aspect of the ‘Dragon Gate’ tradition. Today, the Wu Liu tradition is preserved (and fulfilled) within the Qianfeng School developed by Grandmaster Zhao Bichen. The 6th Generation Ancestral Master was Li Xuan (李虚庵) – a Confucian scholar associated with the ‘Horse Spirit Temple’ (马神庙 – Ma Shen Miao) – situated in the Liu-an State area of Lujiang County, Anhui province (this was also the place of his family ancestry). In the ‘Ji Mao’ (己卯) year (1579CE) of the reign of Emperor Wanli (万历), Li Xuan met Master Zhang Jingxu (张静虚) – who was famous for meditating whilst sat on a tiger-skin – and received the full (hidden) and complete Daoist transmission of the ‘Essential Life, Mind-Body’ (性命双修– Xing Ming Shuang Xiu) methodology from him. Around the ‘Ren Wu’ (壬午) year (1582CE), Master Zhang visited Li Xuan (at his family home) and requested a support-fee for pursuing the Dao (5 or 6 silver taels) – but at that time Li Xuan could not raise the requested amount. Later, during the ‘Ding Hai’ (丁亥) year (1587CE) of the reign of Emperor Wanli, Li Xuan was politely invited to stay at the home of Cao Huanyang (曹还阳) – who lived in the Wuyang area of Nanchang County (Jiangxi province). Master Cao and his second brother, together with three friends had all donated silver for Li Xuan but there was still not quite enough to meet the requirements of the support-fee. Then, Cao Huanyang and two of his friends (who were virtuous and accomplished Daoists), were able to raise 30 silver taels to offer as the support-fee (and subsequently ensured a great breakthrough and the attainment of Immortality). The 7th Generation Ancestral Master was Cao Huanyang (曹还阳) whose ancestral home was the Wuyang area of Nanchang County (Jiangxi province). Cao Huanyang was well-known for his strength and purity of character, and firm upholding of the Daoist tradition. The strength of his purity empowered and enriched all those who encountered him. This is why Master Li Xuan transmitted the full (hidden) and complete Daoist Law to Cai Huanyang in 1587CE. After staying in his home for several years engaged in the practice of Daoist self-cultivation, he was visited by the Nanchang County Magistrate who requested transmission. Master Cao knew that this Official was corrupt and refused to transmit the Daoist lineage to him. The Magistrate became angry and after shouting had Cai Huanyang arrested on the false charge of ‘being in debt’ and had him imprisoned. (This temporarily put a stop to the spread of this Daoist lineage). Cai Huanyang was only freed when the Magistrate died. After leaving the prison he passed on the Daoist lineage to Master Wu (伍) – the 8th Generation Ancestral Master of the ‘Dragon Gate’ (龙门 – Long Men) lineage. The 8th Generation Ancestral Master was Wu Shouyang (伍守阳) – also known as ‘Wu Shouxu’ (伍守虚). His ancestral home was Bixie (辟邪) Village in Nanchang County in Jiangxi province. He was a Confucian scholar with an interest in Ch’an Buddhism. Wu Shouyang first encountered and studied with Cao Huanyang in the ‘Gui Si’ (癸巳) year (1593CE) of the reign of the Emperor Wanli but did not inherit the full (hidden) and complete Daoist transmission until the ‘Ren Zi’ (壬子) year (1612CE) of the reign of the Emperor Wanli. During the intervening 20 years, Wu Shouyang sought the true teachings from over a dozen teachers all of whom turned-out to be either false or possess incomplete knowledge. He was exploited and taken advantage of by some of these so-called ‘teachers’ who took his money and stole his land. This situation reduced Wu Shouyang to a state of utter poverty, which allowed him to dedicate his entire life to Daoist practice with no distractions. This was when he met Cao Huanyang again, who was so impressed with his purity of mind (and body) and dedication to the Daoist path, that he transmitted the full (hidden) and complete Daoist lineage to him. 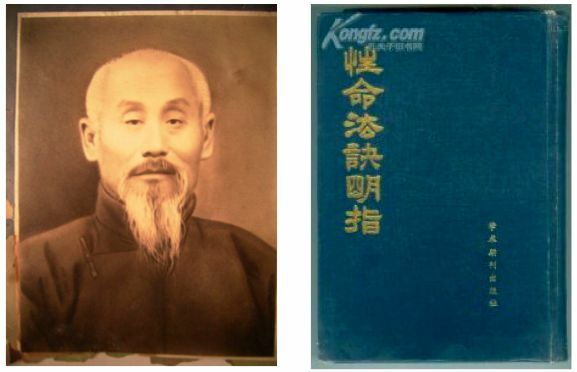 Wu Shouyang became a greatly renowned Daoist practitioner who is considered the author of the following important Ming Dynasty Daoist self-cultivation books: 1) ‘Divine-Sky Immortal Correct Principle’ (天仙证理 – Tian Xian Zheng Li), and 2) ‘Immortal Buddha Integrated Lineage’ (仙佛合宗 – Xian Fu He Zong), which are now very famous in the world. Recorded by ‘Li Sibai’ (李思白) - also known as ‘Beautiful Jade’ (琼玉 – Qiong Yu). Toward the end of the 4th year of the reign of Qing Dynasty Emperor Jiaqing (1799CE), during the 5th month, the Ch’an Buddhist monk named ‘Knowing Emptiness’ (了空 – Liao Kong) – also known as ‘Pure Stillness’ (清静 – Qing Jing) – received the full (hidden) and complete Longmen-Wu Liu transmission and became the 10th Generation Ancestral Master. This transmission happened on the bridge outside the main gate of the ‘Western Benevolence Temple’ (西仁寺 – Xi Ren Temple) situated in Beijing. There are many other and different names associated with this lineage, but at this time I do not know them.